The Sulphur Porters of Ijen work in some of the toughest conditions you can imagine, doing the most physical of jobs: mining. 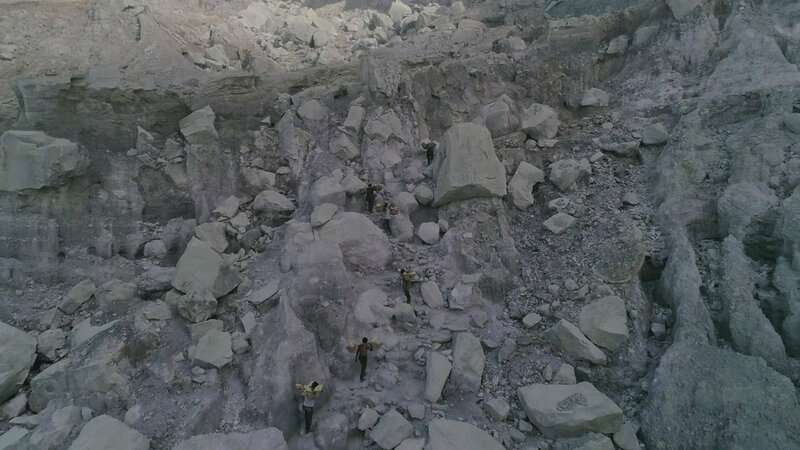 Every day they face highly toxic fumes, a treacherous landscape and carry an immense weight up an almost vertical rock wall, all for one single purpose; to provide a future for their loved ones. Imagine a thick cloud of toxic sulphur gas engulfing you, your eyes burn and itch, you are unable to breath, protected merely by a piece of cloth, but you have to keep going, keep working. These are the realities the Ijen sulphur miners face everyday. Around 200 miners work in the heart of the volcano chipping away solidified pieces of sulphur from the mine and carry loads of up to 95 kilograms (209 pounds) up 300 meters (980 feet) to the crater rim. A two hour hike down the side of the mountain follows before they finally reach the delivery station. All this without any modern equipment or tools. The work environment is beyond tough and many of the workers have inadequate protection against the harsh conditions. Thick clouds of toxic sulphur gas are blown through the crater by strong and ever changing winds, causing respiratory problems for the miners. The heavy loads of sulphur they carry out of the crater and down the mountain leave thick scars on their necks and shoulders and many suffer from joint injuries in their knees. One porter makes two trips daily, and this six days in a row. To survive. To provide a future for their family. The small pay the miners receive for their hard physical labour is still one of the best earnings in the region, thus the miners keep coming back to the volcano day after day. However, this small fee only provides basic living conditions and a simple thing like eating a piece of chicken is often considered a luxury. Many people are unaware of the fact that sulphur is all around us and that we use it almost daily. You can find it in toothpaste, pharmaceuticals, wine, water treatment, gunpowder, electronics, the list goes on. 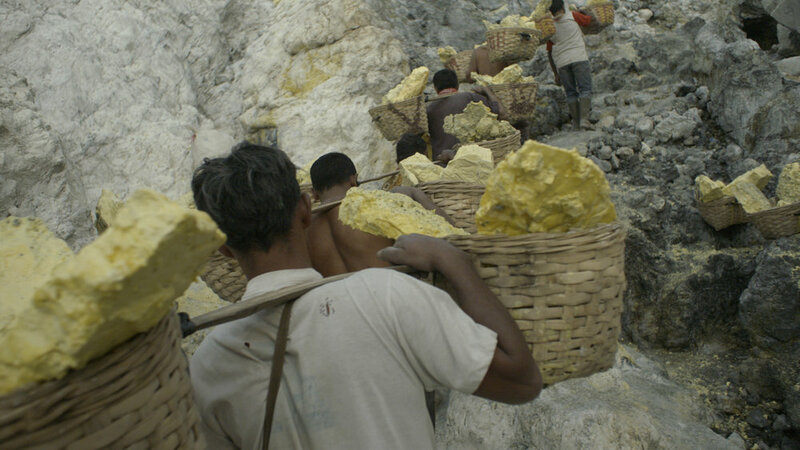 The story of the sulphur miners of Ijen is not just their story, it is our story as well. As long as we continue to use the minerals they extract from the earth we are all participating in their suffering. We hope that we can come together to extend a helping hand to the community of the Ijen sulphur miners.